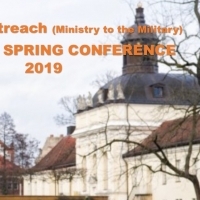 Freedom Outreach International, a ministry to the military, is holding our annual Spring Conference at Freedom Worship Center Velburg located between U.S. Army Garrison Hohenfels Training Area and USAG Bavaria Grafenwoehr/Vilseck bases in Germany. The event will also be hosted by our FOI center, the Freedom Worship Center Velburg e.V..
Conference Format: Join us for a refreshing and empowering time of worship, instructive teaching, dynamic preaching and fellowship. Conference begins Friday evening with corporate worship at 1900. Saturday morning breakout sessions will precede lunch and an opportunity to tour the local area. Saturday evening corporate worship begins at 1900. The conference ends Sunday following the morning sessions. Children's ministry and nursery will be offered in all sessions. Teens will meet 0900-1230 Saturday. Conference Lunch-In: On Saturday after the morning break-out sessions, we will host an optional onsite lunch-in so that we can have fellowship together. There is a cost and you can purchase your meal tickets with your registration. The buffet lunch will consist of deep fried turkey, chicken, BBQ ribs, pasta, salad, vegetables, fruits, drinks and desert. We ask that you please indicate if you will be attending this lunch-in during the checkout process so that we can better prepare. LODGING OPTIONS -- attendees must make their own reservations. The cost of lodging is NOT included in the conference price. What if I do not have a VISA, MC, American Express or Discover Card to pay the conference fees? Pay To: Freedom Outreach e.V. There is no minimum age, but everyone will be required to wear their conference ID for security reasons. If you are staying in Velburg, the church is located just a few minutes walk from most of the hotels and restaurants in Velburg. We have plenty of parking at the church for all that attend. You have 7 days before the event to cancel. There will be directed parking upon arrival. We will have full child care including special classes for children and teens.